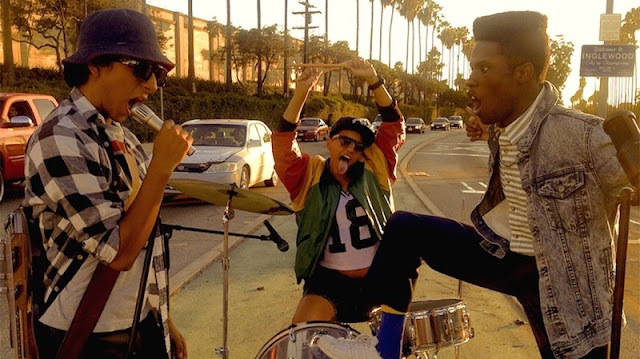 Dope is an endearing but overly plotted coming-of-age teen movie about the struggles of escaping the perils of your immediate surroundings. Filmmaker Rick Famuyiwa's film centres on a trio of black teenage geeks obsessed with '90s hip-hop culture, desperately trying to stay alive, and prosper in the Los Angeles suburb of Inglewood, California. The film wears its pop culture influences, sharp dialogue, and use of social media on its sleeve in a vibrant fashion. We follow Shameik Moore's Malcolm, sidekicks Tony Revolori and Kiersey Clemons, their plight as misfit high school seniors obsessed with "white people sh*t", and Malcolm's quest to get into Harvard. Narrated omnisciently by producer Forest Whitaker with a killer soundtrack no doubt influenced by executive producer Pharrell Williams, the film never lacks energy or talent but the somewhat ambitious narrative tries far too hard to connect every dot and thread of the increasingly involved plot and its many digressions. Starting out as a rather thoughtful comedy about a very specific teenage experience, the film quickly turns into a drug/crime caper filled with overly stylistic narrative tricks and an abundance of quirky but well acted characters, played by the likes of Zoë Kravitz, Blake Anderson, Lakeith Stanfield, model Chanel Iman, rapper A$AP Rocky, and their countless subplots. Not lacking for style or insight, Famuyiwa's script and direction mostly works from scene to scene, but the whole suffers from so many underdeveloped ideas. Not all of these are paid off fully and the many endings wrap up far too nicely despite few clues to lead the viewer around all of the film's little twists. Famuyiwa's layered dissection of young African-American identities and the culture class of high school is charming but often convoluted as it juggles far too many different genres. Dope brings up and explores important themes concerning the black teenage experience in America but diverges too far going from drug dealing to ethics and even the legalities of Bitcoin.